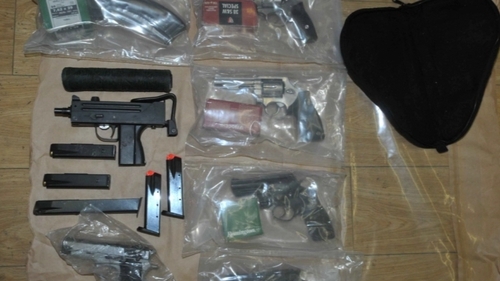 A 52-year-old man has admitted possession of a large cache of ammunition discovered by gardaí at a business park in Dublin two years ago. Declan Brady, from The Park, St Wolston’s Abbey, Celbridge in Co Kildare, was arrested in January 2017 by officers investigating the ongoing Hutch-Kinahan feud. He pleaded guilty to firearms charges at the Special Criminal Court and was remanded in custody for sentencing next month. Three other men have already been jailed in connection with the seizure. Gardaí investigating the ongoing feud raided an industrial unit at the Greenogue Business Park in Rathcoole, Co Dublin on 24 January 2017. Officers from the Drugs and Organised Crime Bureau discovered 15 firearms and over 4,000 rounds of ammunition. These included nine revolvers, including Magnum, and Smith and Wesson models. Four semi-automatic pistols, including a Baretta; an Ingram sub machine gun and a VZ assault rifle were also found, along with five magazines for various calibre of bullets. Brady was one of four men arrested in connection with the arms seizure. The other three are serving sentences in prison. His trial was due to begin today, but just before midday he became the final person to plead guilty to these offences at the Special Criminal Court. It took the registrar several minutes to read out the full list of guns and ammunition connected to the charges, and Brady replied "guilty" when both charges were put to him. The 52-year-old was also facing a number of other charges but the prosecution asked for a 'nolle prosecui' to be entered in relation to these, meaning the State will not be proceeding on these counts.